The campsite at Leroo-La-Tau was located on the inside of a very sharp bend in the river resulting in it being low-lying on the gently sloped banks of the riverbed and the channel was also incredibly narrow at that point and the cliffs on the opposite bank were sharp and high. Probably also due to the sharpness of the bend the stream, when it used to carry water, it had cut away at the bed deepening and etching away at the floor creating pools that were deeper than normally found in our area. The underground stream surfaced here creating pools that although muddy in places provided a substantial amount of surface water in these desperate times. In the winter time when the Zebra and Wildebeest came to the Boteti this was one of the most reliable natural water points in this part of the Boteti and therefore one of the favourite lion hangouts. We were working at the lodge, just half a km north of the campsite, and in the June – July South African school holidays, our campsite had developed a reputation for being a great place for South Africans to enjoy the bush. I remember a group that came by that July. There were 5 adults and they spent had 3 or so nights in the campsite. We got to know them quite well as we took them on numerous game drives during their stay. On their last day on their departure, they came up to the lodge to wish us goodbye, and while doing so they told us the following story. It is not a personal experience, but well worth the telling. A little history. There were 2 couples and a single man in the group. They were travelling in 2 vehicles, each of which had a rooftop tent, one for each couple. It seemed that the single man, was a late inclusion to the trip and so was a little unprepared. The tent he had been given was one of those tents made as a 2 man tent, you will know the type I am talking about if you have ever slept in one. They say they can sleep 2 people but if you are a solid South African male, the tent fits you like a sock. Now, the group had arranged their campsite South African style, like laagering the wagons, and in such a way where the vehicles faced the fire side on to provide some protection from the cold and also to provide a security backing to the bush on one side of the fire. The little 2 man “A” shaped tent was placed between the 2 vehicles with its opening end facing the fire and it was this mans job to keep the fire going throughout the cold, cold nights. The group had placed their bundles of wood along one side of the tent. The man, and only because I can’t remember his name, lets call him Jan van Wyk, had developed a regular fire maintenance routine in the previous 2 nights of opening the tent zip, reaching over to his right without fully waking up, grabbing a log from the pile and crawling to the fire where he would place the log on the coals to keep them going, and then to save time and effort, he would simply reverse back into his tent. It seemed to have been working well. On this third night, it was blistering cold with a cold front moving across Southern Africa from the South Atlantic. There was talk of snow on the Drakensberg mountains. We always knew that 2 or 3 days later the cold would reach us and it had done so. Jan spent a lot of time keeping the fire going so was not getting much sleep. He claims that around 2 in the morning, he crawls out of his sock tent, leans to the right, grabs a log from the pile and heads to the fire on all fours. En-route to the fire he realises all is not as it should be, there is something remiss in his surroundings and it was lying along the left-hand side of his tent, the opposite side to the bundle of firewood. In his sleep-deprived state and with a slow reaction time, things were taking time to register. Still on his way to the fire to deposit his log, it sinks in that this out of place shape on the left-hand side of his tent is watching him. It slowly dawns on him that the big tawny shape watching him can only be one thing. Jan was now at the furthest reach of his journey away from the protection of his tent however small it may be. Jan recalled that when he realised this, there were only 2 options racing around his brain and these were, “pretend you didn’t see it” and “run like hell”. Only one of these options would help him survive the night. Jan opted for, “pretend you didn’t see it” figuring that as he didn’t know how long the lioness had been there, and how many trips to the fire she had witnessed already, why change the recipe. It sounded like when playing hide and seek with young kids, when they cover their eyes they think that as they can’t see you, that you can’t see them either. Jan closed his eyes, probably muttered a healthy prayer under his breath, didn’t turn round and just reversed back into his tent where he lay down knowing he was as far away from this lioness as the thickness of his pyjamas and the canvas of his tent. He was very tense. As the fire died down and it got colder, Jan now firmly refusing to leave his tent to put more logs on it, the lioness, seeking warmth, leaned in closer. As she leaned in closer, Jan tried to move away from her finding his sock-like tent and the bundles of firewood restricting his escape. Van Wyk’s Choice was no better than Hobson’s at this point. Jan says he kept telling the lioness to go away. He used the Afrikaans “voetsek” as one would to a dog, but while to a dog you can shout it out, to a lion, …………….. you have to whisper. It didn’t work though. His friends claimed to have woken up to Jan’s desperate and quiet “voetsek, voetsek” noises, but thought he was sleep talking and so hadn’t bothered to even look out the window at him. They just went back to sleep leaving Jan to be cuddled by his new friend. 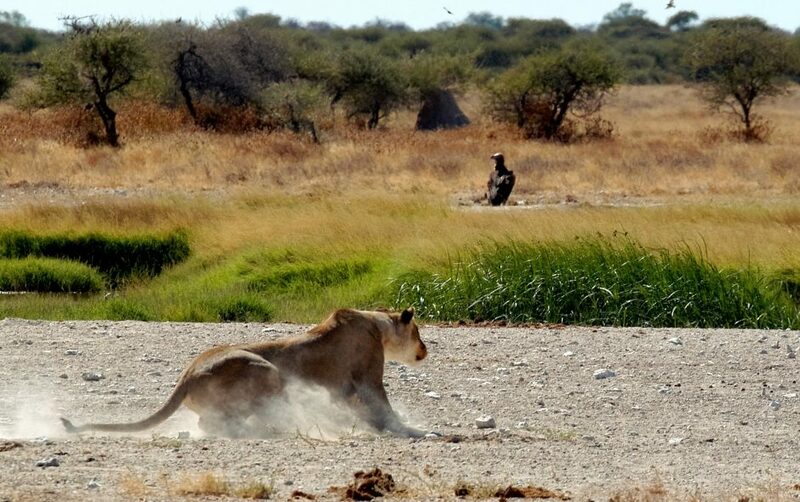 Jan claims it was a long night and that just before dawn the lioness got up and left him. He says that in a way it was his warmest night he had experienced at our campsite, but he would have preferred to have been cold.